Sysadmin Stories: vExpert Program "You're in!" I have the bad habit of waking up and immediately reading e-mails on my phone. This time I was in for a great surprise that put a smile on my face. I got accepted to vExpert program. I consider it to be both an honor and a responsibility. I know my blogging is not as frequent as I wish to. And together with VMUG co-leaders we are striving to make VMUG meetings fun and interesting. The only thing I can do is to keep on giving back to community and make it better each time and hoping to see more and more people at VMUG Romania meetings. So, thank you for this amazing ride (so far). And a special thanks to Constantin Ghioc (Titi) and Jorge de la Cruz for determining me to apply to the program. 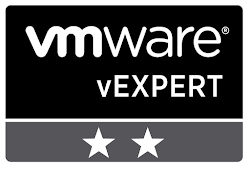 My profile on vExpert Directory is here .